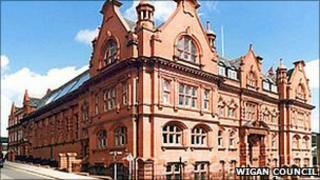 Up to 820 jobs could be lost at Wigan Borough Council as part of its efforts to tackle a £55m budget deficit. The Greater Manchester authority, which has already banned external recruitment and slashed overtime, said front line services would remain a priority. But it has now revealed staff could bear the brunt of the cuts, which are being blamed on a reduction in public sector funding. Council leaders are now in talks with trade unions over the final figure. The council said that between 650 and 820 posts could be lost over three years - up to 10% of the work force. Wigan Council's executive director of business support services, David Smith, said: "We have met the trade unions and have served legal notice we will be beginning consultation with our workforce over this issue. "As we have previously stated, we will be looking at all the different options for making these cuts, including natural wastage, redeployment and early retirement, but given the size and scale of the cuts that need to be made we cannot rule out some compulsory redundancies." The authority is already examining all spending in a bid to make value-for-money savings and spending on capital projects is also being reviewed. Leader of Wigan Council Lord Smith said the authority faced some tough decisions. "We are still at the very beginning of the process and at this stage are not in a position to say which service areas are likely to suffer," said Lord Smith. "Our priority is to ensure our staff are kept informed throughout this process and offered the support they need during this difficult time."